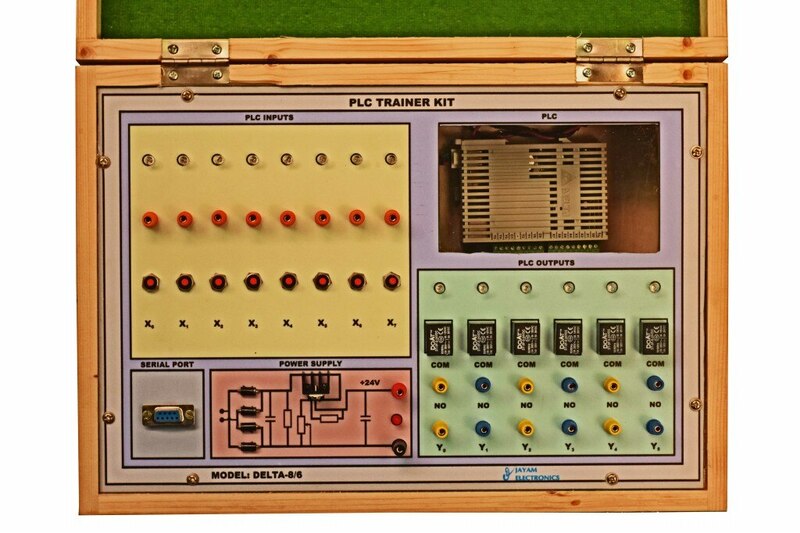 Delta PLC Trainer kit 8 digital inputs and 6 digital outputs +24V Power supply Delta Professional Programming software RS 232 Communication cable from PLC to system Switch inputs and LED indication for simulating the inputs LED indication in the outputs Proper termination of inputs, outputs and power supplies Wooden casing and detailed manual ------------------------------------------------------------------------------ A programmable logic controller (PLC), or programmable controller is an industrial digital computer which has been ruggedised and adapted for the control of manufacturing processes, such as assembly lines, or robotic devices, or any activity that requires high reliability control and ease of programming and process fault diagnosis. They were first developed in the automobile industry to provide flexible, ruggedised and easily programmable controllers to replace hard-wired relays and timers. Since then they have been widely adopted as high-reliability automation controllers suitable for harsh environments. A PLC is an example of a "hard" real-time system since output results must be produced in response to input conditions within a limited time, otherwise unintended operation will result.